In this Post: Wise men and gift giving themed Sensory experiences and learning. Hello, Dear Ones! As we wind down our study of the Christmas story we finally make it to the wise men. I wanted Leeland to remember how the Wise Men gave gifts to Jesus. Also, I wanted him to think about the star that led them. So we focused on “giving gifts”, the star, and a little bit about the camels (for fun). These themes opened up to other characters like St. Nicholas and even Punchinello (from Max Lucado). Leeland learned it truly is “better to give than to receive”. Here’s how we learned! We read books on giving. This led to us learning the true story of St. Nicholas (AKA Santa Claus). We do not practice the Santa Claus tradition in our house. We do however learn about St. Nick and we like to wear the red hat. Ha! Leeland calls Santa the “Yo Ho Ho Man”. He goes around saying, “Yo Ho Ho, Merry Christmas!” Michael likes to put a pillow up his shirt and don the hat and beard. I live with goofballs…that I love so much. The kids watching Punchinello and the Most Marvelous Gift. Max Lucado is a Christian author and his stories about a wooden person who becomes friends with his Creator, the Wood Carver, are spectacular. In this movie, we learn all the Wood Carver wants for Creator Day is to spend time with his creation. Leeland playing with his gift sensory box. I found the small presents at Walmart and I added mini bows, foam trees and penguins, and cotton balls for snow. I put them into a gift box. Leeland likes to move objects into different containers. This kept him busy for a bit. Follow the Stars Game- Leeland followed paper stars to the “Baby Jesus”. 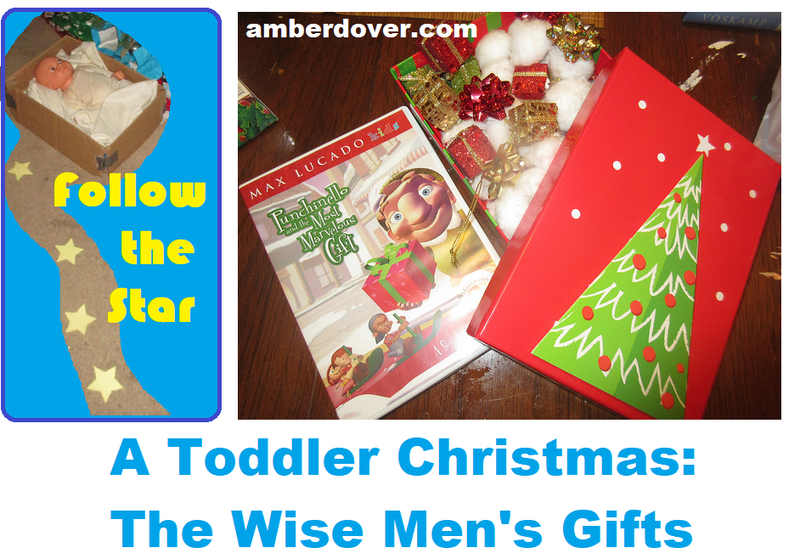 We had fun playing this game all over the house and it introduced him to the concept of the Wise Men following the star. The Wise men’s gifts– a sensory experience using incense. The Camel’s Tale and What is Christmas?– books on Wise men and the Nativity.